Channeling melodic death metal and Norwegian black metal alike, Los Angeles’ THE FUNERAL PYRE takes on the two legendary genres in what has to be billed as a welcome addition to LA’s crowded extreme music scene. Locking in over 100 shows throughout 2006 alone in support of the band’s second full-length, The Nature of Betrayal, THE FUNERAL PYRE is down and dirty, do-it-yourself metal for the common man. Mixing haunting Swedish-style melody with grim blackened vocals and swirling, ethereal keyboards, THE FUNERAL PYRE might best be described as a modern conglomeration of black and death metal. 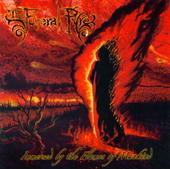 Forming in Southern California in 2001, THE FUNERAL PYRE has already cut its teeth and amassed an underground following through a string of self-booked national and west coast tours, shows alongside bands as far and wide as Trivium, 3 Inches of Blood, Suffocation and Vader among others, and a string of demos and independent releases prior to hooking up with Bay Area indie metal label Creator Destructor Records in 2006. Recorded at Ulug studios in Costa Mesa, Calif. and featuring minimalistic yet engaging artwork from Ben West Design, The Nature of Betrayal marks a departure for THE FUNERAL PYRE, seeing the band hook up with Prosthetic Records in a licensing deal through Creator Destructor. Now with international and domestic distribution alike and a bigger label’s backing, the band with self-described DIY punk rock roots hopes to continue inching forward toward the extreme music limelight yet stay grounded with continued relentless touring in support of The Nature of Betrayal.